In ancient China, dragons were not just an important symbol, but they represented the bloodline of Chinese royalty. 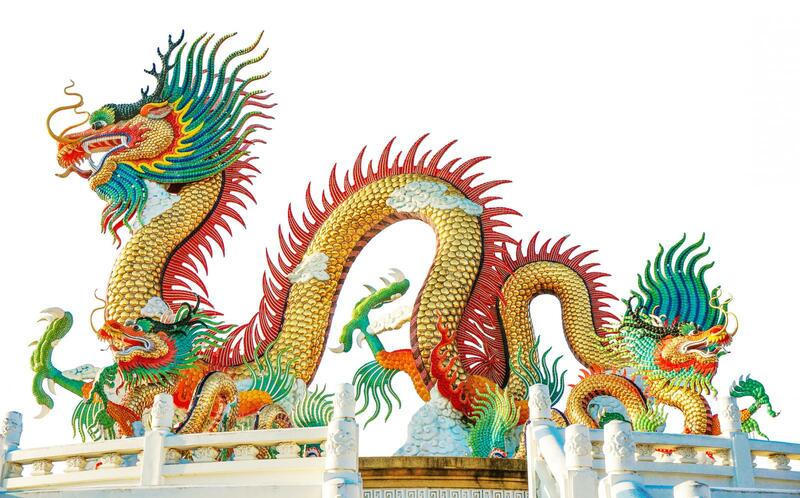 Throughout ancient China, dragons are depicted in temple architecture and numerous artifacts. Considered by the modern western world to be dragon myths, ancient Chinese history contradicts this view. In feng shui philosophy, based upon the Chinese culture and belief system, the dragon symbolizes prosperity and abundance. The dragon, also spelled in Chinese as lung, long, or loong, is powerful and can overcome all obstacles because it's valiant and heroic. It's also a great protector of the people and their wealth. The ancient China dragons were considered gods. This historical symbol, dating sometime around 5,000 BC, became the crest of the Chinese emperor. Only the emperor was allowed to use the dragon symbol. 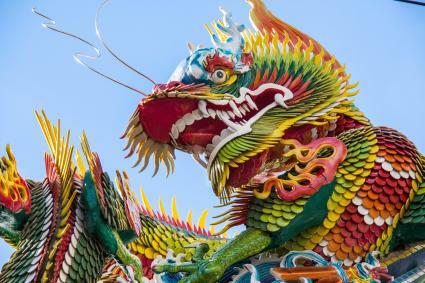 Ancient Chinese emperors laid claim that they were descendants of the dragon gods. This bloodline became an ethnic claim that gave individuals a highly revered status. To perpetuate this status, the emperors built temples and shrines in honor of the dragon gods. To further the exaltation of this status symbol, they commissioned pagodas built throughout the country and established the practice of burning incense and offering prayers to the dragon gods. In Chinese culture, nine is the sacred number of the emperor. It was believed that the dragon king could change into nine different dragon forms. The Beijing Nine Dragon Wall in China depicts over 635 dragons, but there are only nine different types of dragons depicted that the dragon king shifted into in order to serve the world. The Horned Dragon was the giver of rain. The Winged Dragon had dominion over the wind. The Celestial Dragon was the protector of heavenly mansions of gods. The Spirit or Spiritual Dragon blessed the earth with rain and wind. The Earth Dragon was the god of lakes, rivers and seas. The Dragon of Hidden Treasures or Underworld Dragon served as the guardian of hidden treasures such as gems, gold and other precious metals. The Coiled or Coiling Dragon dwelled in the waters of the lakes and oceans, guarding these bodies of water. The Yellow Dragon emerged from water to bestow the art of writing to Emperor Fu Shi. The Dragon King was the god of the wind and sea and all four directions, east, west, north, and south. The significance of the number nine continues throughout Chinese mythology and culture. In ancient Chinese dragon mythology, it's said that the dragon king had nine sons after copulating with different animals, creating hybrids. Each son was sent into the world with specific duties as the heir protectors of Earth and its people. While there seems to be an inconsistency in the actual names of the nine sons, their physical attributes and missions are always the same. Ba Xia : The tortoise dragon was exceptionally strong, and his likeness is found in book holders and other stone objects that support weight. Chi Wen: This beast-looking dragon son was known to swallow up all kinds of things, especially flood waters. The likeness is found in palace architecture to ward off fires. Pu Lao: This son was a small dragon but was known as the noisemaker since he loved to hear his own roar. This dragon image is used on bell handles. Bi An: The tiger dragon had the ability to see inside men's souls and knew instantly who was good and who was evil. This coveted discernment is depicted in the dragon's likeness in statues and motifs found in government buildings, prisons, and courthouses. Qiu Niu: This dragon son loved music. Its likeness is found as a motif decoration on stringed instruments. Fu Xi: This hornless dragon son loved books and literature. His image is found on libraries and even embossed on book bindings. Ya Zi: Known for his short-temper and love for fighting, this dragon son's likeness is carved on the hilt of swords, knives, battle axes, and other weapons. Suan Ni: This dragon son was covered in flames, something he enjoyed doing especially creating fire and smoke. This dragon likeness is often used in front of homes for protection. It's also used as an incense burners motif. Chao Feng: The fearless lion dragon was a risk-taker and always observed the world from high places. This dragon likeness is used as embellishments on roof corners, especially in ancient palace architecture. The oldest known depiction of a dragon was discovered in 1984. It's called the Coiled Dragon and was carved out of jade. The figure was found on the burial chest in an ancient cemetery dating to the Hongshan era (4700 - 2920 BC). Other jade carvings of dragons have been found in abundance during the Liangzhu era (3300 - 2200 BC). The Chinese dragon has a distinct appearance. The dragon physical attributes were often a combination of various body parts, such as horns and types of claws. Some were combinations of a lion and dragon, said to be the result of the dragon king copulating with different animals. Traditionally, the Chinese royal dragons have five toes or claws. The Chinese four-toed dragons are considered common and not part of the nobility. Korean dragons have four and the Japanese dragons have three. The Chinese dragon has chin whiskers that tend to be shown as long tendrils. The horns of a deer are often seen in Chinese dragon depictions. A camel's head is often drawn for a dragon head. The eyes of a rabbit may be part of the dragon's physical makeup. Chinese dragons has the neck of a snake. The abdomen often the shape of a cockle shell. The dragon scales are those of a carp. The claws of a dragon are the talons of an eagle. Some dragons have tiger paws instead of talons or claws. The dragon ears are typically like those of an ox. The story of the four dragons is one of several that explain the Chinese reverence for dragons. In ancient times, the Jade Emperor ruled over the earth. The four dragons, Long Dragon, Black Dragon, Pearl Dragon, and Yellow Dragon asked the Jade Emperor to send rain to the drought-stricken world. The people were dying. The Jade Emperor agreed, yet never sent the rain so the four dragons took it upon themselves to gather water from the lakes and spray it across the heavens. When the Jade Emperor discovered what they'd done, he had four mountains placed over the dragons so they would be trapped for all eternity. The four dragons turned themselves into rivers to flow around the mountains. The rivers became known as the Long River (Yangtze), Black Dragon (Herilongjian), the Pearl River (Zhujiang), and Yellow River (Huanghe). Feng shui capitalizes on the powerful energy of the dragon with practical applications of this symbol. You can use the dragon in your home for attracting great abundance and prosperity. The dragon and phoenix are often used together in feng shui as the symbol of perfect yin yang energy. This is placed in the southwest sector of the home to ensure a happy marriage for a harmonious and balanced union. The dragon is used as a symbol of great power and success and can be placed in the north sector for career luck. You can place the dragon is the east sector since it is guardian over this direction. Set a dragon statue in the southeast sector to protect and accumulate wealth. Ancient China dragons are such an intricate part of the Chinese culture that they're found in almost every kind of art form and architecture as symbols of protection and prosperity. You can use the dragon's power in feng shui applications to infuse into sectors, such as career or wealth.